These are the most challenging events I’ve ever done, listed in order of difficulty. The difficulty is completely subjective, but it gives you an idea of what I think are harder: e.g., double centuries vs. marathons! Remarkably, in 2012 Adventure Journal listed the Tour Divide and the Furnace Creek 508 as the two most difficult races (of any sport) in the world. 4,233 (non-stop race, not a tour) A self-supported, one stage cycling race from the Oregon to Virginia coasts. I finished 8th place in under 24 days despite getting Shermer’s Neck after 2,900 miles. 2,700 (non-stop race, not a tour) 200,000 feet of climbing from Banff (Alberta, Canada) to Mexico. Snow, thunderstorms, monsoons, bears, mosquitoes, mud, mechanical problems, starvation… and each racer must do it self-supported. I finished 6th in the ’08 race and at the time was the 11th person in the world to have successfully done this. 2011 Furnace Creek 508 Vintage bicycling 510 With 10 epic mountain stages, like doing multiple Death Rides in a row on virtually no sleep. I did it on 1983 technology, establishing a Classic Randonneur age group course record. 2011 Boston-Montreal-Boston Bicycling 753 A very hilly RUSA Permanent in New England, including some climbs of >15% grade, entirely self-supported over 3.4 days. 2003 Paris-Brest-Paris Bicycling 762 The oldest, most prestigious amateur cycling event in the world. There are almost no stretches longer than a mile that are flat. 2003 Davis Brevet Series Bicycling 124+187+249+373 = 933 The largest brevet series in the U.S. to qualify for PBP, it stresses self-sufficiency while testing the limits of one’s physical endurance and mental determination. 2011 Colorado Brevet Series Bicycling 132+198+255+373 = 958 A brevet series in the Rocky Mountain State on the Super Bike. 1999 California Triple Crown Stage Race Bicycling 210+200+200 = 610 Take 2 of the top 10 toughest events I have ever done, the Terrible Two and Devil Mtn. Double. Throw in the difficult Central Coast Double. Now do all 3 of them and add up your times. Until a few years ago, I was the youngest person ever to complete this. Back-to-back marathons Running 52.4 I did this three times: Davy Crockett Bear Chase (overall win) + Big-D Texas Marathon in 2010; Bismarck + Montana marathons in 2012; Seneca Creek Greenway Trail Marathon + Naked Bavarian Trail Marathon in 2016. Fort Collins-Colorado Springs Cruiser Ride Bicycling (cruiser) 300 Biking down to Colorado Springs and back on an $88, 41-pound, 1-speed, pimped-out Huffy cruiser bike. That’s 300 miles in 40 hours on a course with hills. Possibly some sort of world record for a Huffy cruiser. 2008 Sulphur Springs 100 Trail Running 100 Finished with just 17 minutes to spare, in Canada. One-hundred miles is just an absurd distance to run. 2010 Boulder 100 Running 100 It took me 2 attempts (2007 & 2010) to complete this run. It’s one of the flattest century runs in the U.S., but the distance is still hard! 2006 Rocky Mountain Double Marathon Running 52.4 Hills, thunderstorms, loneliness… and 52.4 miles on foot. The only time I resorted to Advil during a run. 2003 Ironman Coeur d’Alene Triathlon 2.4 swim + 112 bike + 26.2 run = 140.6 As if doing a full marathon is not hard enough already, try running one after swimming 2.4 miles and biking 112! This was my first Ironman, and hence my toughest. 2006 Ironman Arizona Triathlon 2.4 swim + 112 bike + 26.2 run = 140.6 It was a war. 2003 Davis 600km Brevet Bicycling 373 Rain, cold, more darkness than daylight, sleep deprivation, and signficant climbs… a total adventure! The Terrible Two (1999 and 2000) Bicycling 200 1999: Several 15-18% grades and double-summit climbs. 16,000 feet of climbing. >90 degrees of heat. This course is hard enough by itself–and I had to do it with bronchitis! 2000: Same course as ’99–and still had to dig deep to beat the official 16:30 time limit. 2001: “Devil-less” this year (no Mt. Diablo)–but the Oakland Hills with their gazillion false summits made it seem even harder than the traditional course! 2007 Quicksilver 50 Mile Trail Running 50 In truth, the course was harder than the Rocky Mountain Double Marathon. But it was so well-supported it felt easier. 2006 Pikes Peak Marathon Trail Running 26.2 Altitude (at the top: above 14,000′), >7,000′ elevation gain, technical trails, etc. made for a really tough time. 2002 Heartbreak Double Bicycling 202 40+ mph winds the whole day. Rolling hills or long climbs the entire way. Bitter cold. Epic. Mountaineering 21 Up and down in just one day. The altitude (14,496′) really messed with my head. 2003 Climb to Kaiser Bicycling 156 13,500′ of very concentrated climbing, mainly in the first half. And the second half was plagued by 105 degree heat and strong headwinds! 2002 World’s Toughest Century, Superstar Course Bicycling 140 The Superstar Course has 15,500′ of elevation gain. Several 16-20% grades, including the infamous Corkscrew Wall. 2004 Stacey’s Run From Lam Running 40 A charity run for a friend, it gets special mention for being the first time I ran more than 50k (self-supported too). 2007 Bataan Death March Running 26.2 I learned in this event that running 26.2 miles with 41 pounds on his back through sand is indeed quite hard! 2005 Knoxville Marathon Running 26.2 In this marathon, one is going up or down virtually the entire way. “The third most difficult marathon I’ve ever done,” according to 71-year-old Malcolm Gillis who ran 99 of them, including Boston 8 times. 2002 Markleeville Death Ride Bicycling 129 5 passes over 16,000′ feet of climbing. None of the passes are extremely steep but most are very long. 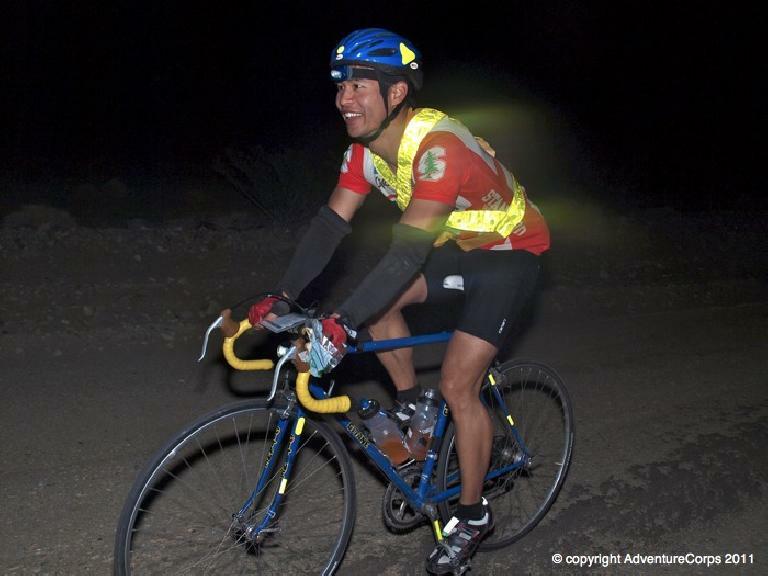 2005 Torture 10,000 Bicycling 104 13,100′ of climbing in just 104 miles? That’s hilly! 2003 Mt. Evans Ascent (CO) High-altitude running 14.5 Longer than a half-marathon, with 90% of it being uphill on North America’s highest paved road (14,260′). Add in an amazing blizzard at the top, and you have… an epic! 2002 Skyline-to-the-Sea Trail, Round Trip Backpacking 71 71 miles in 2 days (including “extra-credit” miles). Terrain is just rolling, but hiking 35 miles for 12 hours/day is not exactly easy! 2004 Vineman Triathlon 2.4 swim + 112 bike + 26.2 run = 140.6 I paced myself well in this one so it didn’t feel so bad, but iron-distance tri’s are never easy. All other marathons Running 26.2 Actually, I still have problems with some marathons, mainly due to lack of training! Some photos on this page may be subject to copyright by their creators. I stumbled across this site awhile ago while doing research on Triple Crown. Then, today Mick from the Benicia bike club forwarded your stuff to me. What an impressive list of activities! I always freeze coming down Diablo. Any tips? I am pursuing newspapers and trash bags for warmth to toss. I have 3 categories of weight to carry – 4.3 pounds for essentials (including water), 1.6 pounds for lights that I could carry or have sag take them, .8# for or “fun stuff”: GPS / heart rate monitor, and another .8 pound for my repair kit. What is your opinion on the weight? I’ve carried this stuff and a lot more on all my training rides, but not sure of the impact it will have on race day. Mulholland: Any idea of “cold” areas on that ride, or am I safe to assume it isn’t anything like the DMD?